Case Erectors are case forming machines that automatically form, fold and seal corrugated cartons from flat boxes. Case erecting systems remove the need for operators to stop packing products to build their cartons. These packaging machines are available in semi-automatic and automatic formats and can form between 6 cases to 20 cases a minute. A Case Erector can be easily integrated into any existing packaging line. Pair it with a Case Sealer for a complete form, fill and seal packaging solution. The addition of a case erector machine to your packaging line can be justified even with a capacity as low as 500 cases a day. Automatic Case Erectors are designed to automatically form, fold and seal the bottom of corrugate boxes, requiring no operator involvement. Pair an automatic case erector with a case sealer for a complete form, fill and seal packaging solution. 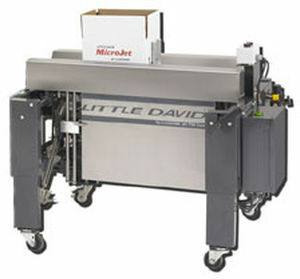 Semi-Automatic Case Erectors can handle a wide range of box sizes. Semi-Automatic Case Erectors require some operator involvement to move cases through the machine. The case erectors can work with case sealers to improve case packing efficiency. The Tape It Right program guarantees an annual cost savings of up to 30%. The Tape It Right Program works with clients to audit and review their existing case sealing practices and equipment. The will improve sealing efficiency and productivity through the identification and standardization of improved case sealing practices. Through this standardization the Tape It Right Program has helped businesses save up to 30% on their annual carton sealing costs. Why Buy a Case Erector? Square corners on your boxes are important when palletizing or stacking your products for shipping. A Case Erecting machine forms square corners that provide a stable base and strong support for the cartons above. These strong square corners give a foundation for weight distribution that helps prevent pallet collapse. Our Packaging Specialist will analyze your existing pallet stacking methods and suggest ways to improve stability and decrease the risk of loads collapsing during transport. Case erectors can form cartons at a faster rate than human employees. On average, a person can assemble an average of 3 boxes a minute. On a standard day with a full 8-hour shift, minus breaks, an employee would be able to assemble 1260 boxes. Running for the same 8-hour shift but without the needed breaks, a case forming machine operating at 6 cartons a minute would assemble 2880 boxes. Our fastest model of case erector would be able to produce 9600 cartons. Using our same examples as before a worker would need 16 hours to complete what a carton erector can do in a day. At a wage of $14 an hour that employee would cost $224. The carton erector operating for 8 hours with a single operator would require wage costs of $112. The carton erector would save you $112 on the production of 2880 cases in half the time.